Gov. 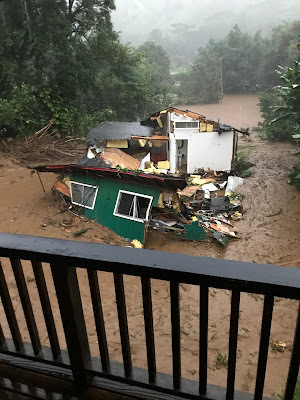 David Ige issued an emergency proclamation Sunday for Kauai after severe rains led to flooding and landslides on the island. Star-Advertiser. Gov. David Ige is calling out his leading political rival, U.S. Rep. Colleen Hanabusa, and top leaders in the Legislature for collaborating on a fundraiser in the final weeks of this year’s session, saying the event sends a clear message to anyone who hopes for anything from the Legislature that they must donate to Hanabusa. Star-Advertiser. A bill that would change Hawaiian Electric Co.'s century-old business model is awaiting Hawaii Gov. David Ige's signature. Pacific Business News. Lawmakers have performed CPR on a lifeguard liability bill that was all but sunk in the legislative session. West Hawaii Today. Ad Watch: Who’s Kim Coco Iwamoto Again? The candidate for Hawaii lieutenant governor attempts to brand herself in her first television commercial. Civil Beat. Republican candidates for state office stump in Kona. West Hawaii Today. Starvation case reveals gap in safety net for abused children. By simply submitting a one-page form, the family of a 9-year-old Hilo girl who starved to death in 2016 was able to remove the child from the public school system to educate her at home despite a long and troubled history with the state’s child welfare system. Star-Advertiser. Hawaii cases of home-schooling and abuse. These four Hawaii cases are included in a national database compiled by the Coalition for Responsible Home Education that tracks severe abuse, including fatalities, of children who are home-schooled. Star-Advertiser. The state’s decision to move forward on redevelopment of the Ala Wai Small Boat Harbor through a public-private partnership drew criticism Friday during a Board of Land and Natural Resources meeting. Star-Advertiser. Erosion, eating away at the shoreline. Star-Advertiser. In Waimanalo, flood clean-up comes with a question: Could this have been prevented? Hawaii News Now. A 41-year-old man was shot to death today after attempting to enter a home in Ewa Beach, police said. Star-Advertiser. Since BikeShare Hawaii’s launch in June, the program’s operator has attempted to charge 107 customers a $1,200 “lost or stolen” bike fee, despite saying that improper docking of the bike is the usual culprit. Star-Advertiser. Zoo addresses vandalism amid push for validation. Star-Advertiser. Dean Okimoto, owner of Nalo farms in Waimanalo, faces a financial setback after Friday night's rain washed away a dozen acres worth of his popular Nalo greens. KITV. More marked police cars sought. About a decade ago, the Hawaii Police Department acquired its first fleet of marked police vehicles, costing around $2 million. West Hawaii Today. Kealakekua draft environmental report raises concerns. About 60 people attended a public comment meeting for the draft environmental impact statement connected to the master plan for Kealakekua Bay State Historical Park, a South Kona site the state Department of Land and Natural Resources and the Division of State Parks have been trying to develop for decades. West Hawaii Today. Residents who live in the area surrounding Kealakekua Bay had a chance to share their thoughts on a Draft Environmental Impact Statement for a Master Plan that will shape the future of the culturally and historically significant place, considered by many to be a wahi pana. Big Island Video News. Uncertainty over whether the Legislature will continue to fund programs to help the homeless has caused at least one nonprofit to pull back on services, including efforts to get more chronically homeless adults and low-income families off the street on Hawaii island. Star-Advertiser. The Public Charter School Commission has voted to put Ka'u Learning Academy on notice about possible revocation of its charter, citing a range of problems including financial irregularities, enrollment discrepancies and testing procedures. Star-Advertiser. More than two weeks after a deadline to submit bids for a surf school pilot program at Kahaluu Bay, local surf schools said they haven’t heard anything from either the county or the nonprofit picked to manage the program. West Hawaii Today. Accidental manure spill prompts advisory. The state Department of Health is asking residents to stay out of Alaialoa Gulch in Ookala after it was contaminated with cow manure. West Hawaii Today. Big Island businesses experience drawbacks trying to fill staff during robust economy. West Hawaii Today. Former Maui County Democratic Party Chairman Troy Hashimoto, former Maui County Council Member Dain Kane and attorney Joe Wildman were selected Saturday as finalists to fill the state House seat of former Speaker Joe Souki. Maui News. The list of candidates seeking to fill the remaining term for the District 8 House vacancy has been narrowed to three: Troy Hashimoto, Dain Kane and Joseph (Joe) Wildman. Maui Now. About 35 traffic signals — some more than four decades old — will be upgraded within the next year, Maui County Traffic Engineer Nolly Yagin said Wednesday. Maui News. While surf splashes against bulging sand mattresses just a stone’s throw away from a Kahana resort’s eight-story towers, plans to shield them from erosion with a 400-foot-long seawall have run into community opposition, a lawsuit and an uncertain future in the state Legislature. Maui News. The southern terminus of the Lahaina bypass was blessed Sunday, and while the controversial project prompted one Maui lawmaker to skip the ceremony in protest, others expressed relief that the latest section of the bypass had finally been built. Maui News. Haleakala’s Changes Hit Small Businesses. Park officials vastly reduced the number of tour companies allowed to operate in the park. Hawaii Public Radio. A public informational meeting for the Paia Relief Route project, originally scheduled for Tuesday, April 17, 2018, has been postponed, according to officials with the Hawaii Department of Transportation. Maui Now. A lawsuit between Kauai Police Department Assistant Chief Mark Begley and the County of Kauai is garnering another $100,000 in legal fees in a battle that’s been ongoing since 2012. Garden Island. Flooding of epic proportions: Homes destroyed, roads closed, many rescued. Garden Island. Commentary: The Crazy Lease Fight Over Molokai Mule Rides. The family that has operated the Kaulapapa tours for decades is fighting eviction with claims based on long-discredited conspiracy theories. Civil Beat.